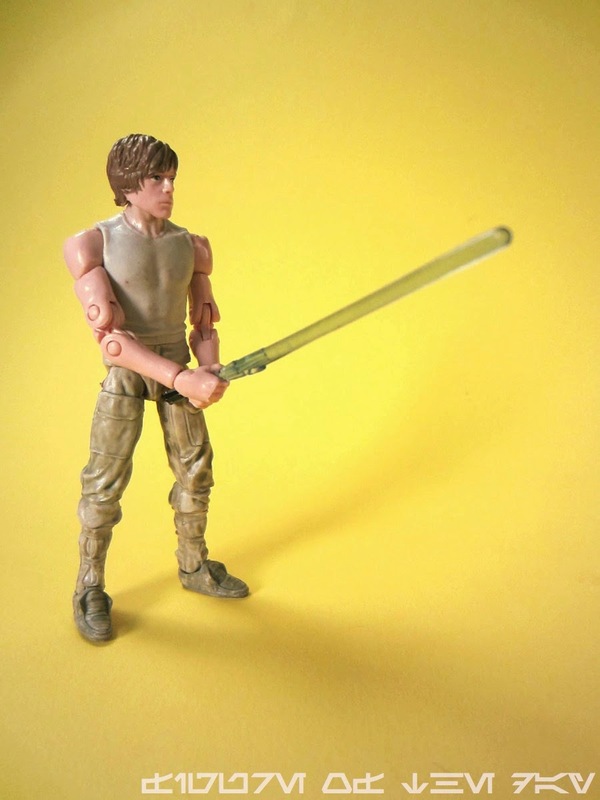 Commentary: For those of you keeping track, Luke Skywalker is a pretty ballsy jump forward with what a 3 3/4-inch Star Wars figure can be, borrowing heavily from what Hasbro has done with Marvel over the last few years. Also, as a June release it's worth noting that the last 3 3/4-inch case of The Black Series was December - six whole months between waves is a very long time and the next new wave is expected in July (at press time, anyway.) This wave has 2 reruns, 3 all-new sculpts, and a nice tweaked version of a previous figure to make a new character. Dagobah Luke is (at my count) at least the fourth "modern" version of the figure since his to debut in 1996, and he's an impressive specimen - but maybe not the best option for a display. One complaint I have about features is that the more you have, the more opportunities there are for mistakes. Thankfully, when it comes to Luke's articulation there's none better and no problems. 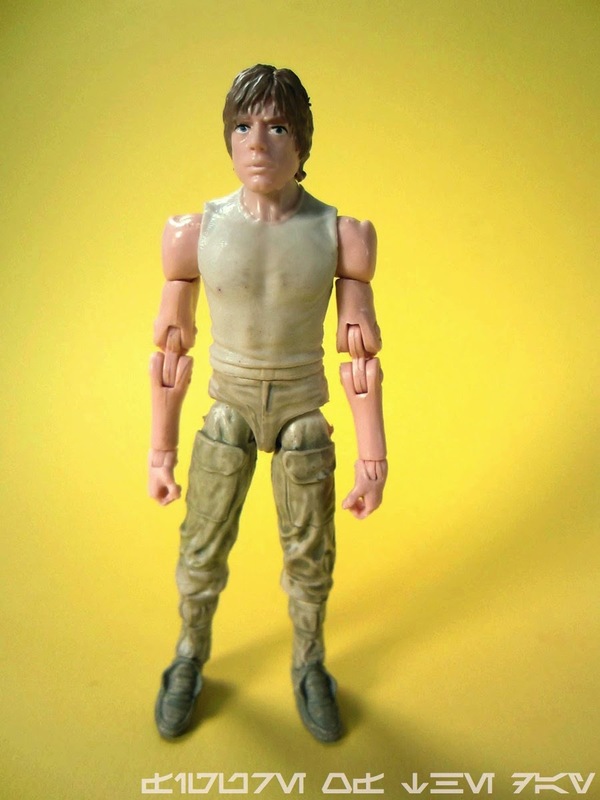 He's on par with Hasbro's finest 3 3/4-inch Spider-Man figure, except Luke has single-jointed knees and not double. 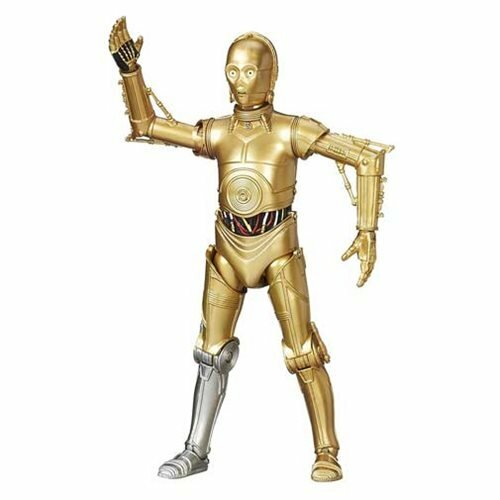 This is nothing to sneeze at - the arm joints look about as good as you can expect out of human flesh arms, and the figure has (depending on how you count) 26 joints... or can be moved at about 18 different spots on his body. So any way you slice it, he's still the best-articulated Luke figure of all time. Hiding joints is difficult, particularly on fleshy arms or legs - at this scale, you're going to notice rivets and such. 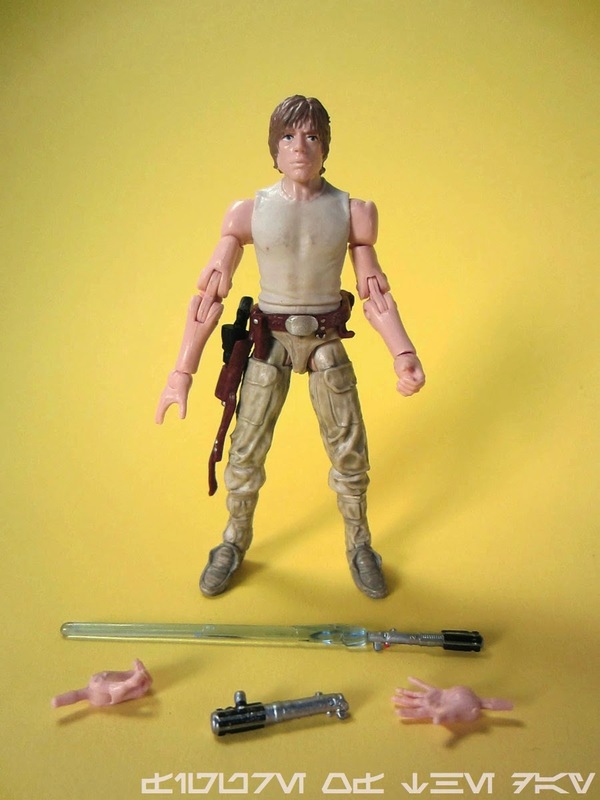 It's a trade-off... if you want a joint-free set of arms, get the very good 2004 Original Trilogy Collection Dagobah Luke - he has swappable arms and heads, plus (if you ask me) looks better as a display item. 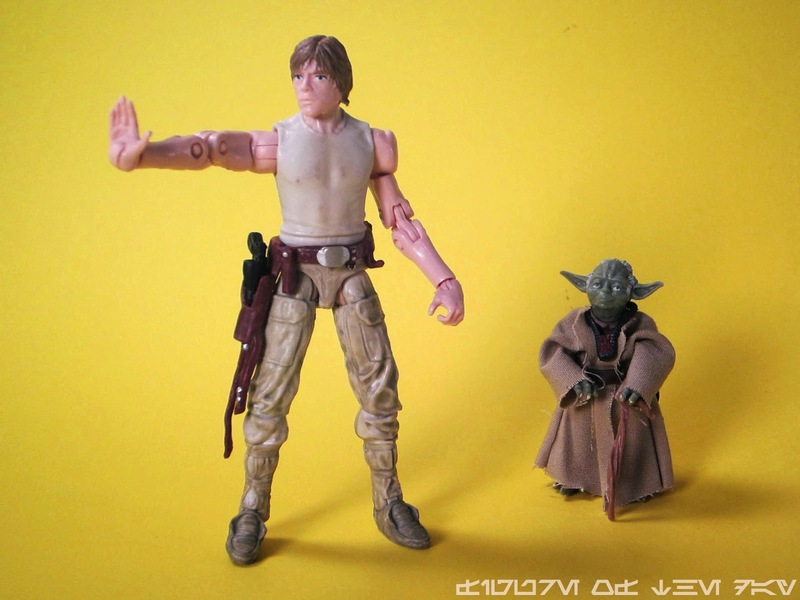 This new one lets you pose the figure, which means you get to spend a few minutes with the ankles and knees getting the "sweet spot" so he doesn't topple over when Yoda is in the backpack. It's imperfect - cool, but not as simple and elegant as the 2004 solution. The sculpting is about as good as you might expect, and Luke's head is not the horror show of the early stock photos of the packaged product. There's a tiny bit too much white in the eyes, but it's an improvement over what many of us have feared. He looks a little more haggard and tired from his training with more lines near his eyes too, and I suspect that the paintjob could be improved on a rerelease and this would look like a more perfect figure. His hands can hold his lightsaber (or not, if you use the open ones) and the holster can hold the blaster too. Unlike some other figures, you get a lot for your $11 and I doubt you'll feel short-changed as piece count goes. But is it perfect? No. I've got two complaints I consider to be valid. 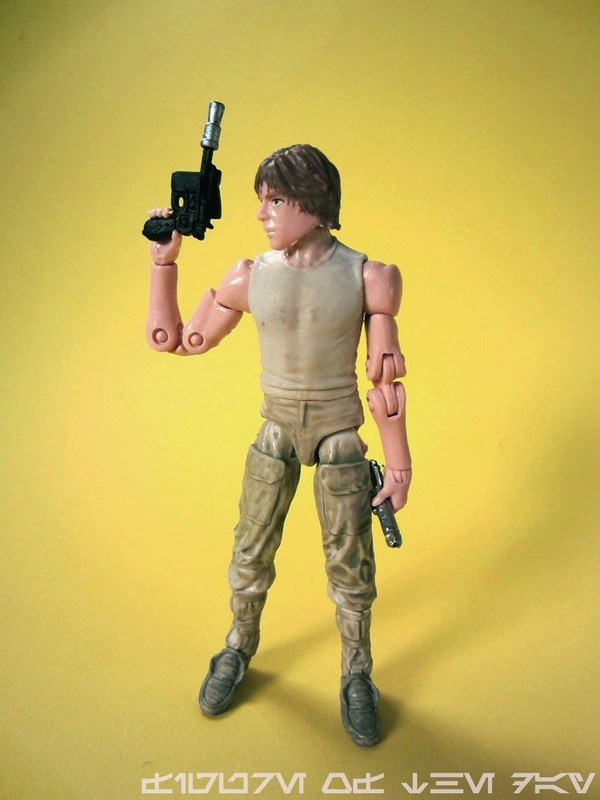 Valid Complaint #1: Luke's lateral leg articulation - which works great, and legs him sit in vehicles or stand with ease - has flesh colored rings viewable from the sides. Ugly, and something that should have been caught and corrected before the first unit shipped. 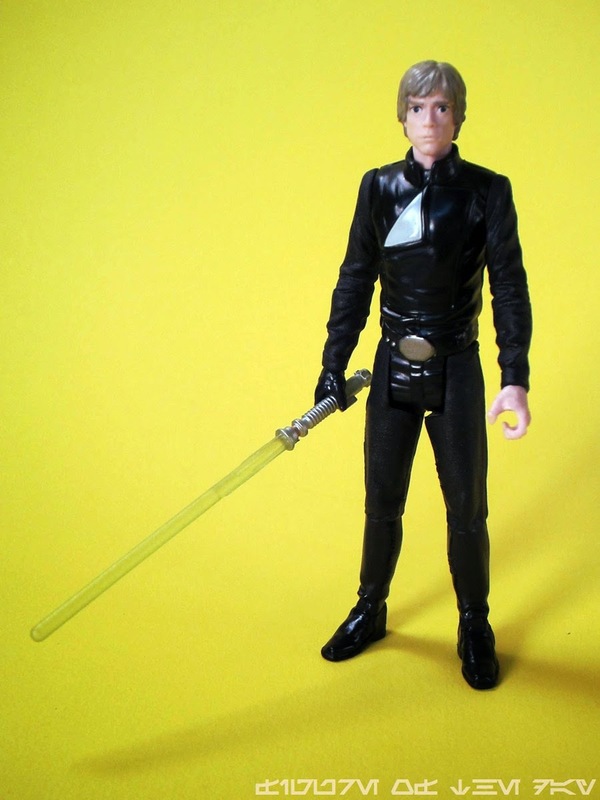 Valid Complaint #2: Luke has a lightsaber hilt, and a belt designed to carry a hilt. The two cannot interact - the belt has a peg looking for a loop, and the lightsaber has a peg looking for a hole. I suspect this was a result of a factory communication issue and the wrong hilt was included, but the point remains that it doesn't quite work right. 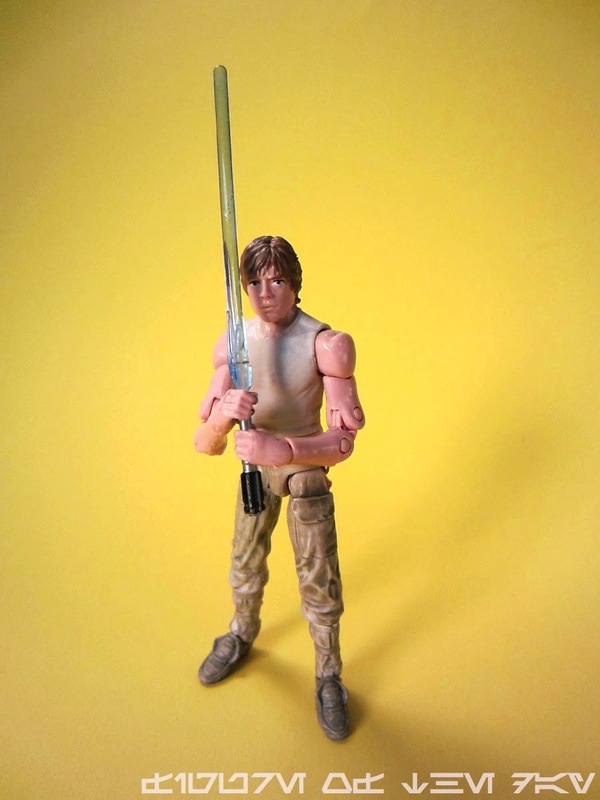 Dagobah Luke is without question the most poseable version of the outfit (and indeed the character) at this scale, as most Dagobah Lukes clock out at under 10 joints per. 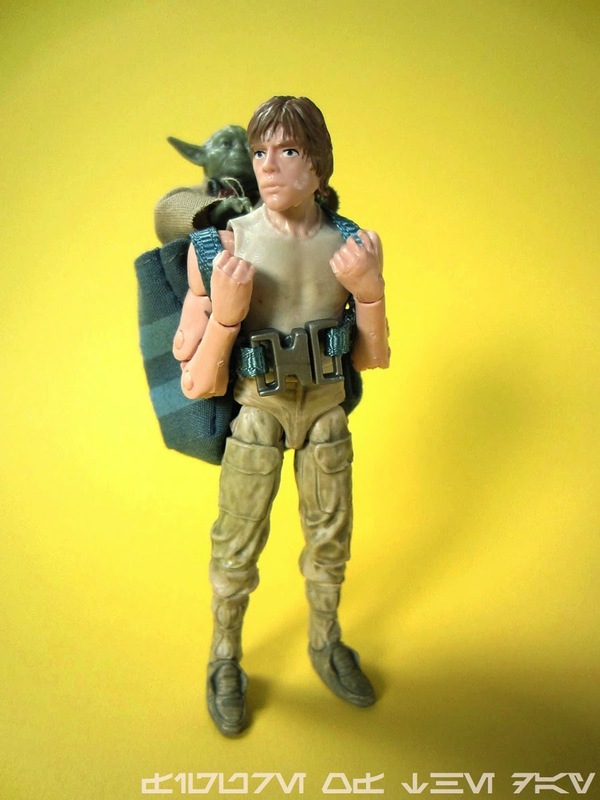 I appreciate the figure having the rocker ankles, bend-and-swivel wrists on all 4 hands, and double-jointed elbows that can kinda, almost hold on to the training backpack (sold separately with Yoda) straps. This is a very ambitious figure and shows Hasbro did put a lot of thought and love into the design. The execution? Well, that could be better. Either way, it's the wave's gem and I suspect he could very well be the peak of what Hasbro can do at this scale and at this price point. Collector's Notes: This figure started shipping from online toy stores late in June 2014. At press time I have not heard of him showing up in big box shops. Availability: At press time there is no concrete evidence of US-packaged figures on the market. To date it appears that it is debuting in Canada, so keep an eye overseas. I have not yet seen one in any packaging on eBay or Amazon. 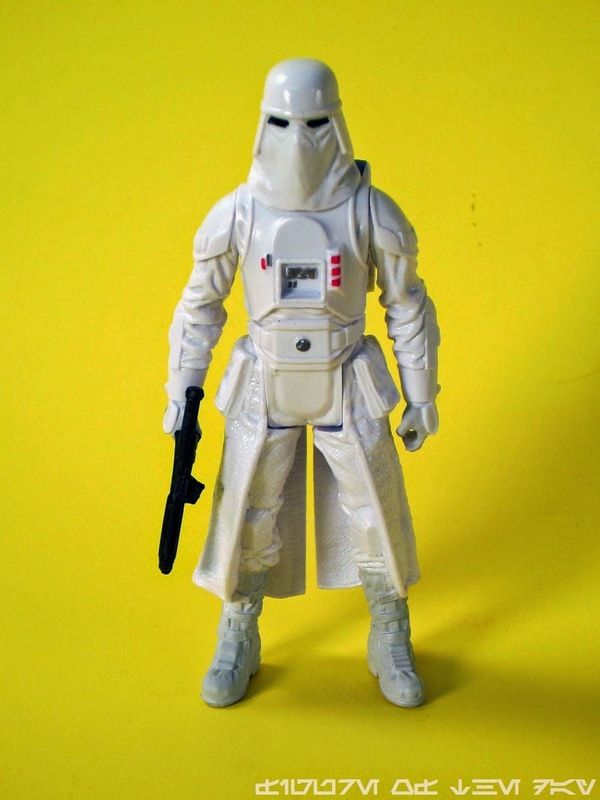 Commentary: We've seen a lot of Snowtrooper figures, but this may be my favorite. The super-articulated Vintage The Saga Collection figure is OK, but bulky and his hat falls off. The 2003 Saga one had an awesome firing tripod cannon, but not a lot of articulation. And the 1997 one, well, he couldn't sit. There have been many of these, but I think this one offers the most as far as standing around goes. He really does look like a modernized take on the 1980 action figure. 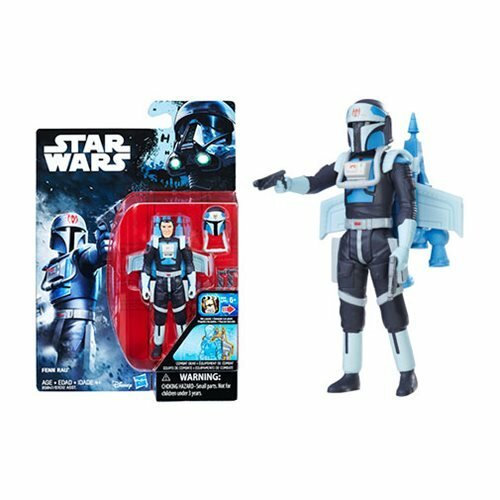 While Hasbro created a figure with the perfect clearance to sit, the wrap around his legs is just bulky enough to cause him to fail the Landspeeder Test. I tried a smattering of vehicles, and found he could sit in the new, smaller Revenge of the Sith Jedi Starfighter without too much trouble. His range of movement is more than acceptable given the design challenge, as his head cannot move but the arms can freely rotate. The legs come closer to a 90-degree angle than one might expect, so if I bet he could fit in my MTV-7 if I could easily find it. Otherwise, the actual sculpting is quite good. The boots have a little dark color on them, the knee pads are glossy, and all of the wrinkles and buttons and textures look better than previous versions. The Vintage 2000s version had a wider mask, this one seems a little narrower than most and I think looks all the better for it. Of course, according to photos, it could be more accurate - the mask should touch the shoulders it seems. So sure, the head isn't as accurate as it could be, but it feels good. That counts for a lot in my book, and I'd buy a few more of these to populate my 2010 AT-AT if given the chance. I do not anticipate being given that chance, so I'm going to be happy with the one and presumably only version of this mold I'll probably ever see. 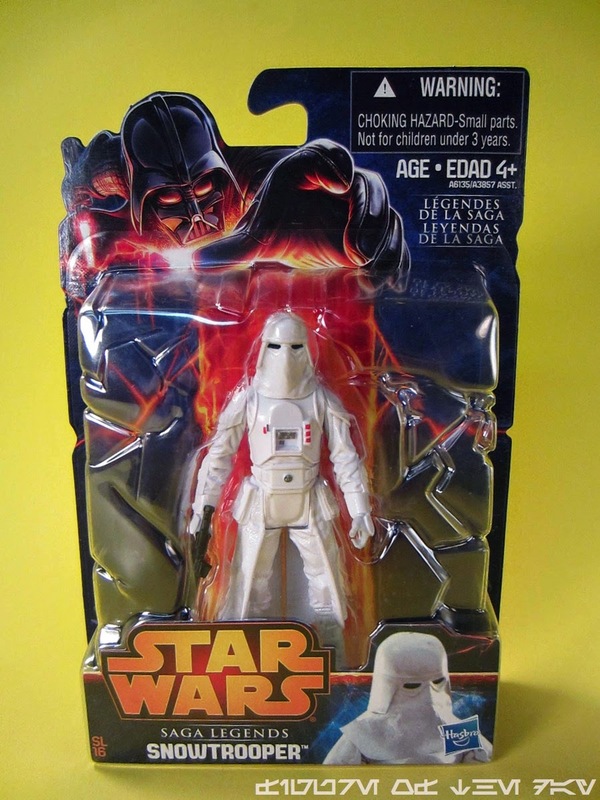 You would have loved buying these for $6 at the store, but like the Stormtrooper before it you're probably going to have to rely on help or just live in another country where this figure is more common. 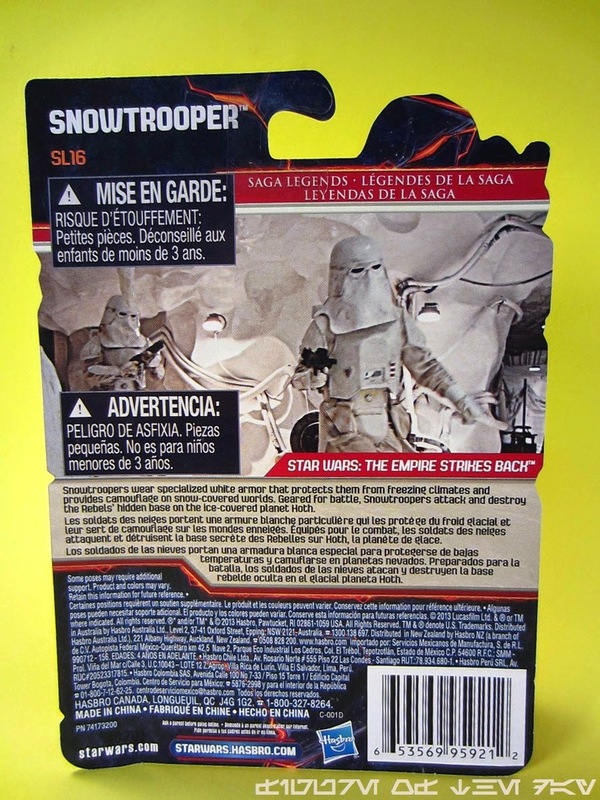 Looking ahead it seems that Saga Legends will continue with Rebels characters and a good smattering of Original Trilogy Empire troops, which, really, what more could you ask for? I'd love more AT-AT Drivers, TIE Pilots, Stormtroopers, and six bucks a whack - especially if they can fit in the vehicles. 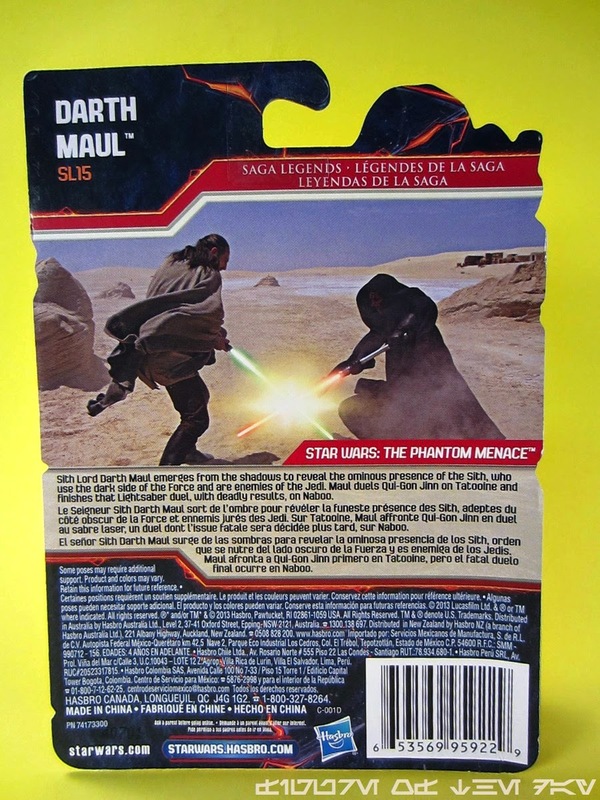 Collector's Notes: I have seen no online pre-sells for US packaging. This pattern - Canadian or European releases followed by a US release much, much later - has happened a few times with Transformers lately, but there have also been quite a figure figures that started out in Europe and stayed there. I'm not seeing on eBay, nor Amazon, so while it could just be early my paranoia kicked in early. 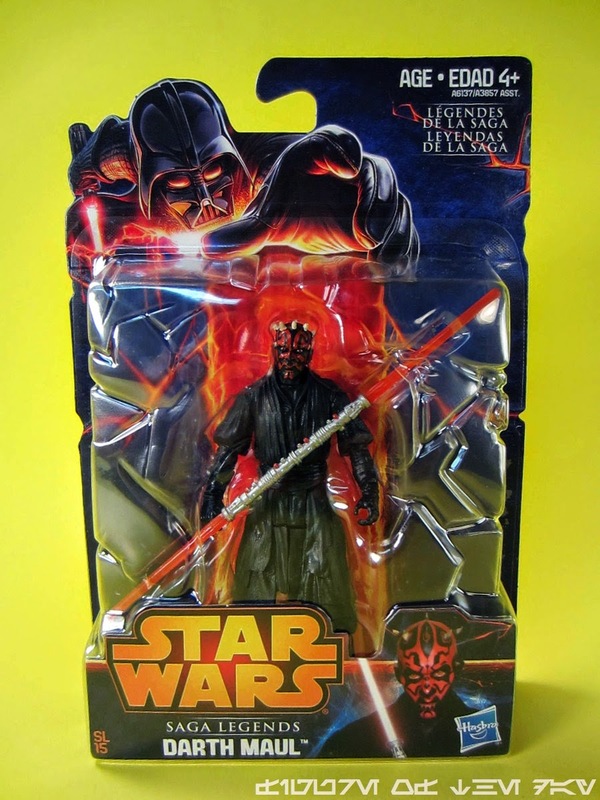 Commentary: At no point did I start 2014 saying "gee, I wish I had another Darth Maul figure." I have plenty - so do you. 2012 got us the Vintage Collection version which is good, but it turns out that even though we got a swell simplified one in a 3-pack there was still room for improvement. Hasbro did a bang-up job on this guy since he stands fairly well. The design is exquisite - Hasbro put a lot of thought into making this guy interesting for anybody. The right hand is rotated slightly, giving him a unique offensive pose while not giving him a wonky arm when he isn't holding his weapon. The left hand is more or less normal, allowing him to hold the blade in a not-too-fun format. It's good for display shelves, but not fun - so really, this figure was designed with a lot of people in mind. 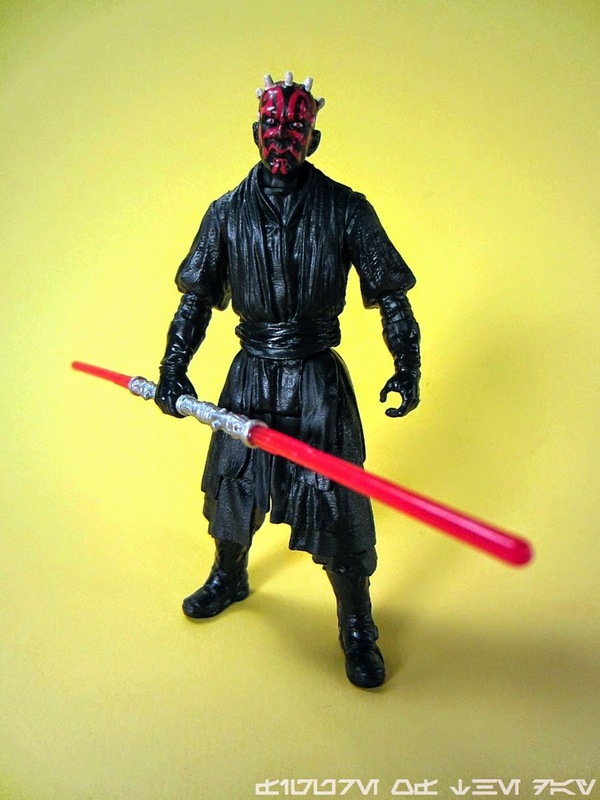 Darth Maul's bulky costume won't allow him to pass the Landspeeder Test, but he can fit in the Hasbro Sith Infiltrator vehicle. That's what really matters - he fits, and he fits well. The detailing on the robe is good, on par with Hasbro's recent better efforts. The gloves and boots aren't terribly glossy, but they do shine enough to be interesting. I really like the head sculpt - the horns are painted well, the face is fierce and determined, and they don't show any teeth here for once. His face tattoos are bright and neatly applied, plus his lightsaber has a silver grip with a few red buttons on it. This may not be all you want in a Maul, but it's certainly everything you need. I'm pleased to have such a figure that can look good, sit, and stand without a fuss - Hasbro did a great job here. Well, they did a great job designing, decorating, and creating it. Getting it to you, the consumer, will hopefully get better in the coming months because man, this is a nice one. 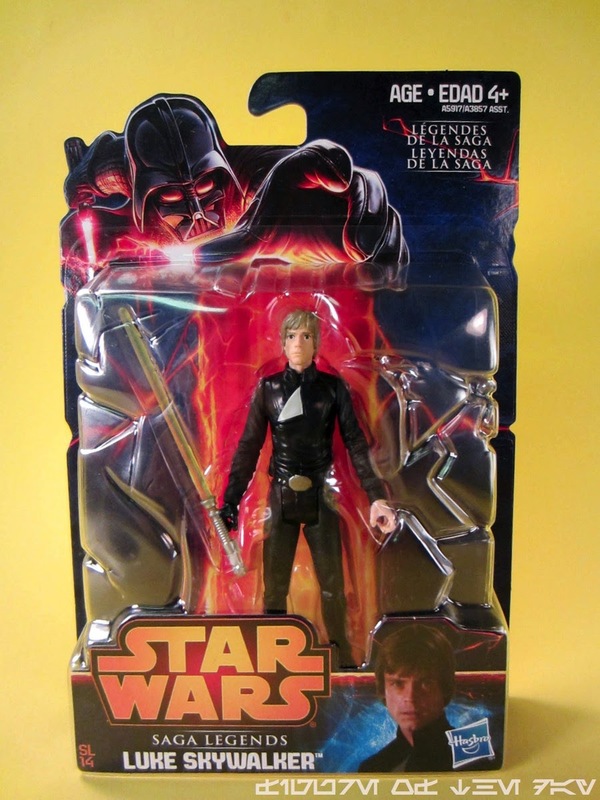 Commentary: As a kid I wanted Luke Skywalker figures. I had most of them as the line went on, but I didn't get some until years later. 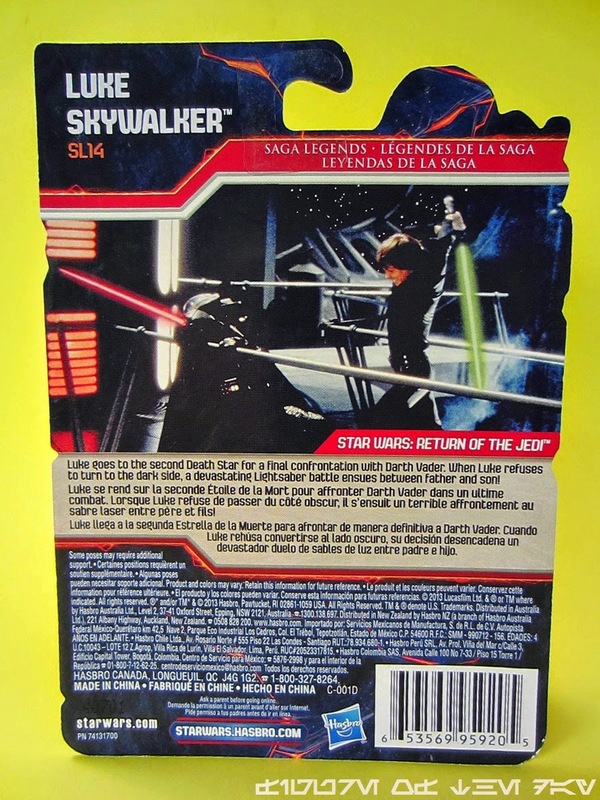 This white-flapped Death Star version of Luke didn't even exist as a figure for quite some time, so seeing it today as a 5-jointed throwback is a real treat. The sculpt is good, the paint is acceptable, and the ability to sit is good enough. He has no problems standing, so he's a winner in my book. The first thing I noticed about this figure is that the eye paint wasn't as perfect as I might like - it's not the worst Jedi Luke, but well, there's some real zingers in there. His eye paint in this version is just a tiny bit too much - the top of the eyes seems to be painted larger than the eye sculpt, but the sculpt itself is exquisite. There's a subtle mole on his left cheek I didn't notice until I put him under my desk lamp, with another similar marking just under his right eye. The chin is good, the hair is good, really this figure is a redeco away form being excellent. 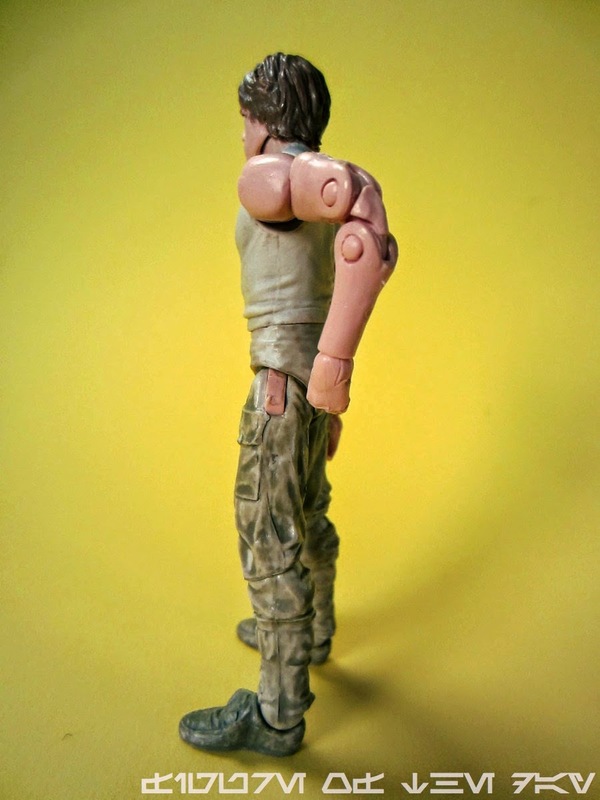 The torso is glossy and the limbs are more matte, with a white shirt flap. The right glove, boots, and belt are glossy which was a real surprise for the so-called discount figure range, and this is certainly the best action figure Margaret Keane ever designed. 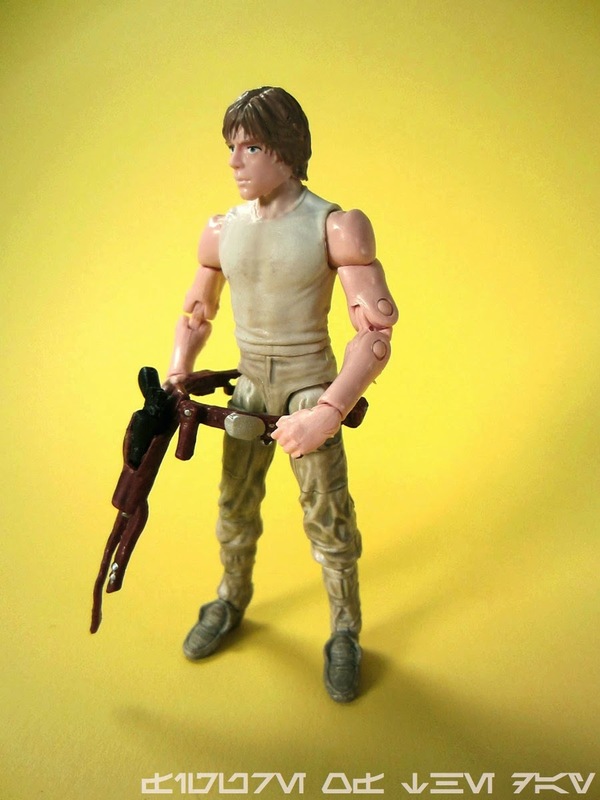 Luke's sculpt is pretty simple - he's skinny, and the outfit is more or less what you'd want in this figure. I'm certainly satisfied with various silver snaps and buttons on his belt, giving the figure a little more detail than I would have expected. He has no problem holding his green lightsaber, which has a silver grip and that gold bit near the emitter. The flare on the blade seems more subtle than usual, too. The figure passes the Landspeeder Test, so he may be a good vehicle pilot if you can find one. It's a good figure if you like this kind of toy - and I do. If you don't, well, I guess it won't matter to you that he isn't easy to get right now. I'm glad I got one, and I hope Hasbro makes more figures similar to him in the future. 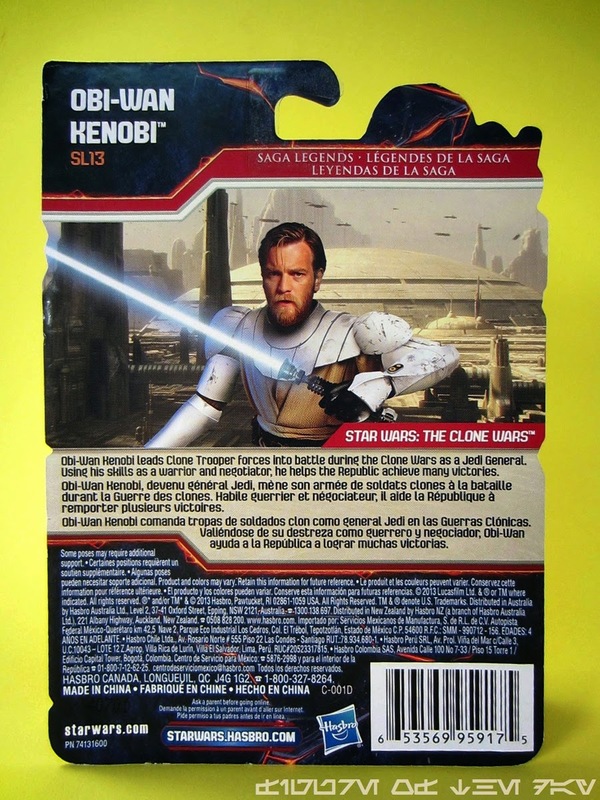 Commentary: Upon his first reveal at Comic-Con 2013 it wasn't obvious to me that Obi-Wan Kenobi was new. It took a while to click that the line for kids would have not one, but two TV-inspired, Ewan McGregor-based figures of the Jedi hero. Considering we just got this costume as a Vintage figure in late 2012 it's quite remarkable to see it made as a kid figure again, but given the seemingly intentionally low distribution of him so far maybe it makes good sense. It's not like it's going to have a chance to rot on the pegs, but neither did the guys from wave 2. This figure was a real surprise - I was expecting a recycled warrior and I got something new and well-executed. 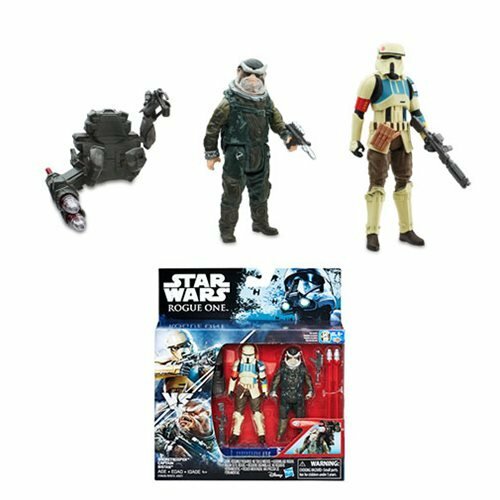 The entire wave is above average - 3 new guys, 2 retools - I gotta give Hasbro credit, this is easily the best new wave of figures in The Black Series so far. 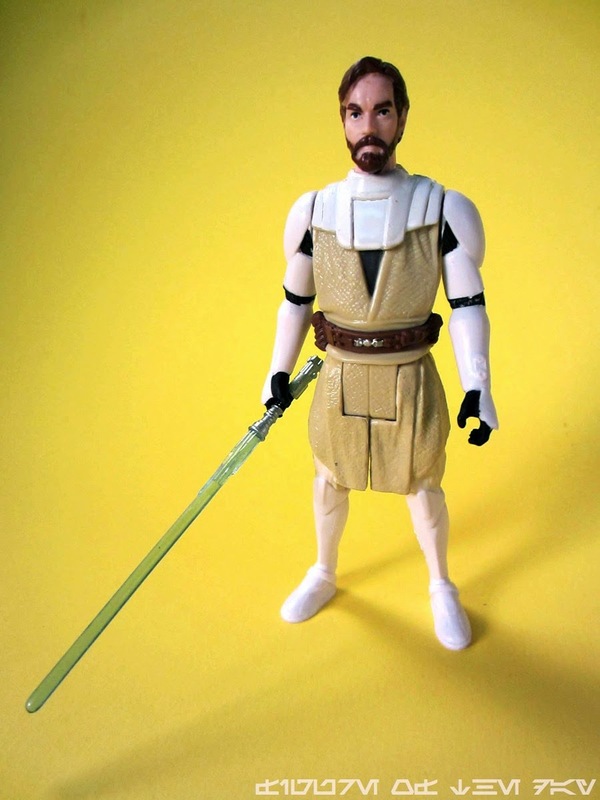 It seems that this Obi-Wan Kenobi's head is similar if not identical to the previous two, albeit with different deco. 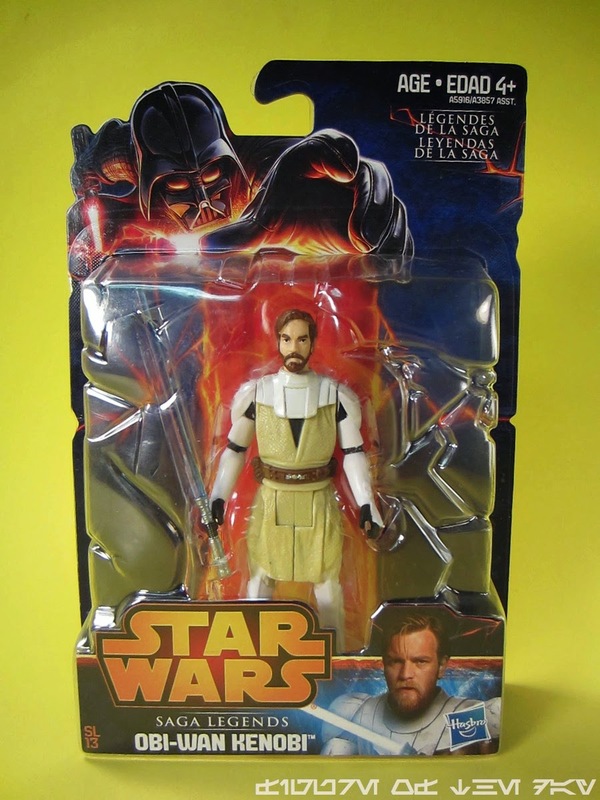 The body and legs seem all new, but the arms may share some parts - I'm unclear, but if you compare the Mission Series 2-pack Obi-Wan Kenobi to this one, it seems the Clone armor bits may be the same. It feels like there's more paint on the new figure, with what seems to be more than one brown in his hair and a surprise like a silver belt buckle around his waist. There is no black paint on the legs for the Clone body glove, but from the waist on up it's pretty dang good. The sculpt isn't bad - there's more texture on the garments than we saw on the 2012 The Vintage Collection figure and it makes the most of its paint budget. There's no Open Circle Fleet logo or Jedi Knight insignia, nor is there any mud or sweat. It's just a nice, armored figure that I would have assumed would appeal to the tiny tots - or in this case, the Canadian tots. The figure passes the Landspeeder Test, in that it fits in a Kenner Landspeeder as well as the most excellent downsized Revenge of the Sith and Attack of the Clones Jedi Starfighters. All I want in a good toy is for it to stand, to sit in vehicles, and to hold his weapons. Many figures cannot do this, but Ben here can! If this figure came out earlier, I'm convinced it would've been a decent hit - it's great, and I wish I had one or two more to sit in vehicles. The lightsaber is cast in blue with silver paint plus a black band around the grip - which is more than I'd have expected. As a complainer, I can't complain about the overall quality here. 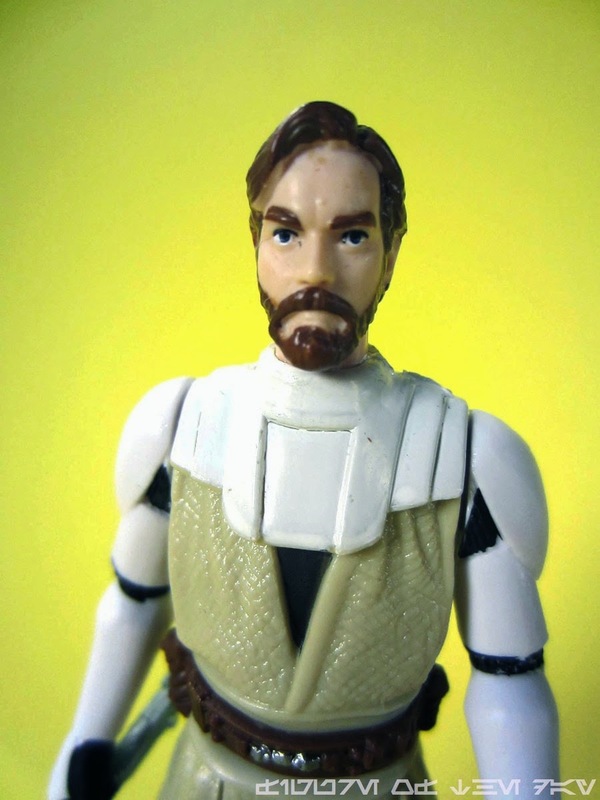 The eye paint is good, the face is expressive, and I'm a huge fan of the Cloned-up Kenobi figures. Get it if the chance arises, I'd even say consider overpaying a couple of bucks if it comes to that. Your not having this figure is something of a tragedy.